Prague is magical. Prague is addictive. Prague is romantic. Cobblestone streets, horse-drawn carriages, an enchanting river and romantic dining. Together with Paris, Venice and Rome , Prague is a truly romantic city and is a favorite destination for special occasions. Come to Prague to propose, to celebrate your wedding and for your honeymoon. Prague at night is even more romantic than during the daytime. Just walk across moonlit Charles Bridge or stroll through the winding lanes in the Old Town, or Stare Mesto in Czech. In summer the city sparkles in the sun. In winter a dusting of snow on the rooftops is breathtaking. Prague has many romantic restaurants to celebrate that special occasion, from a candle-lit cellars to riverside terraces. 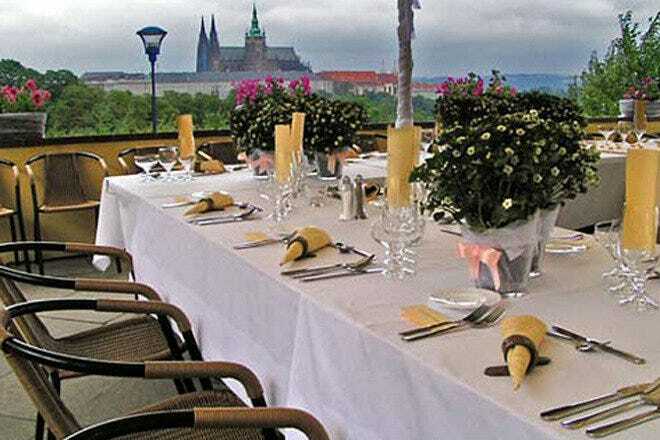 Celeste Restaurant on the top floor of the only Dancing House in the world offers magnificent views across the Vltava River and Prague Castle beyond while you enjoy a five-course dinner. Come to Zofin Palace for a candlelit dinner and savor goose accompanied by red cabbage and dumplings, a traditional Czech dish. If it is duck you would to try, another Czech specialty, go to U Modre Kachnicky, the Blue Duck, and try roasted duck with walnuts. 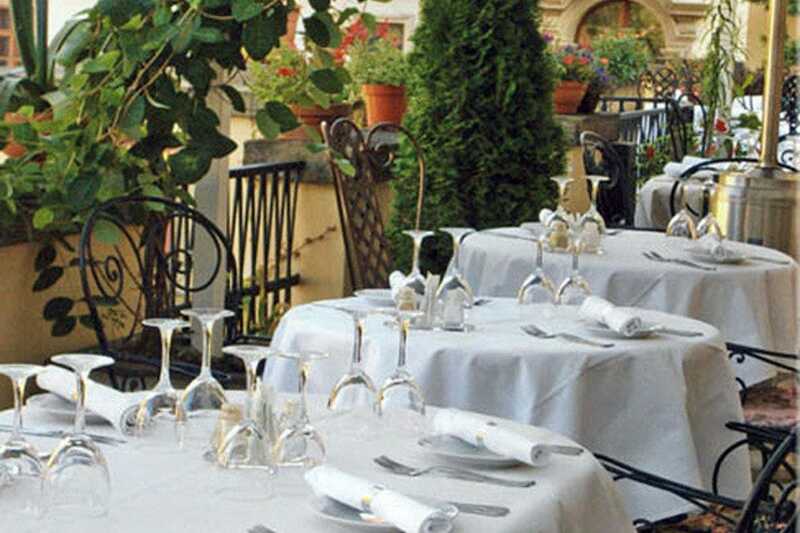 Below you will find a list of the 10 most romantic restaurants in Prague. Located on Slavonic island, Zofin Garden restaurant is the most idyllic spot in Prague to enjoy a gourmet meal at affordable prices. In summer, sit under palm trees in the gazebo that resembles an orangery with a multitude of Mediterranean plants and flowers. Chefs prepare Czech specialties on the open grill. Dining inside the Zofin Palace is equally rewarding. Zofin Garden is excellently suited for families with children. There is a children's play corner inside the marquee and older children can explore car-free Slavonic island, feed the swans or have a go on the swings in the large playground. 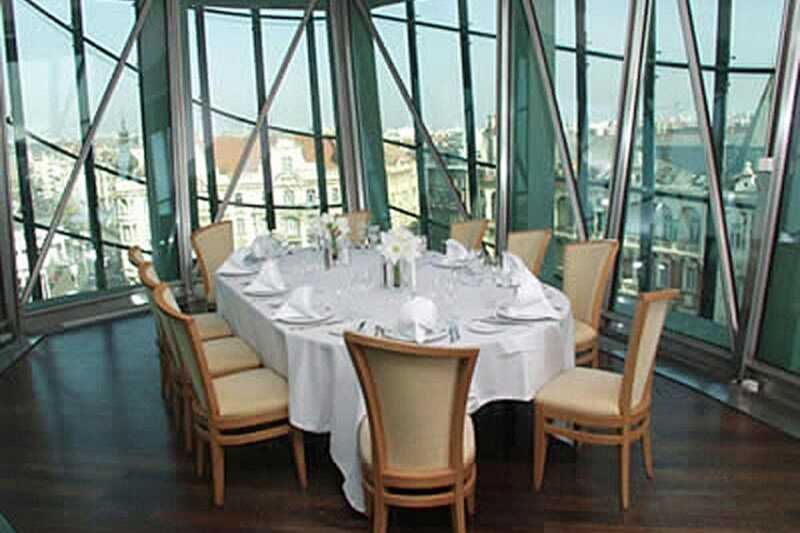 Celeste Restaurants's circular dining room atop the Dancing House offers sweeping, views of Vltava River and Prague Castle. In summer, tables spill out on to the terrace. 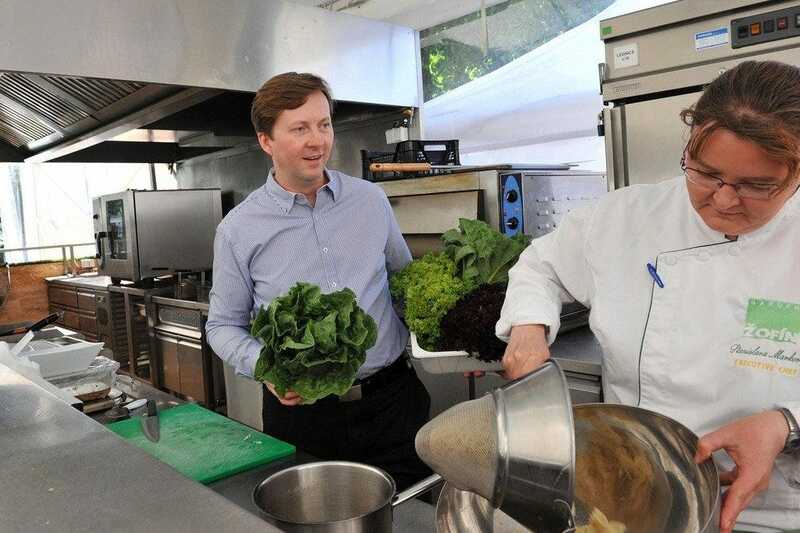 The French chef Gwendal Le Ruyet makes every meal a culinary adventure. Seafood lovers will appreciate the turbot fillet with warm seaweed and crisp apple salad. Fregula pasta, risotto style, with asparagus, parmesan cheese and herb oil is a pleasure for the vegetarian palate. A Pinot Blanc or Riesling Grand Cru is an excellent choice to accompany your meal. Finish the French way with cheese followed by champagne mousse with basil cream and fresh strawberries. 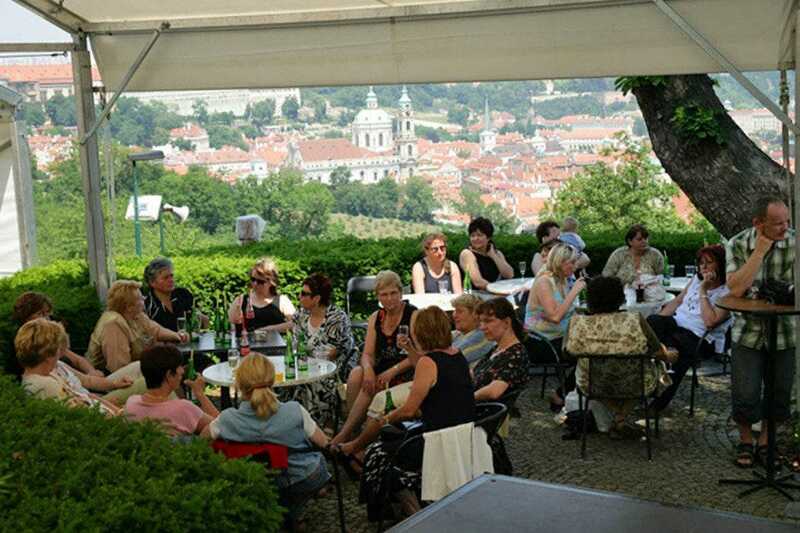 Restaurant Petrinske Terasy is located in one of the most beautiful and romantic spots of Prague; Petrin Hill with sweeping views of the Vltava River and the city beyond. Sit on the summer terrace on balmy days. Large windows allow you to enjoy the splendid view also when sitting inside on a cold winter day. The wooden interior is in the style of a hut. Open fires create a pleasant homely atmosphere. The menu features a selection of tasty dishes like smoked pork ribs, roasted goose or fried cheese with tartar sauce. Krusovice is the best beer to accompany your meal. Nebozizek Restaurant surrounded by woodland is half-way up Petrin Hill. Sit for the best panoramic views in the glass conservatory, heated in winter, or retreat to the main building where the pianist plays most nights. 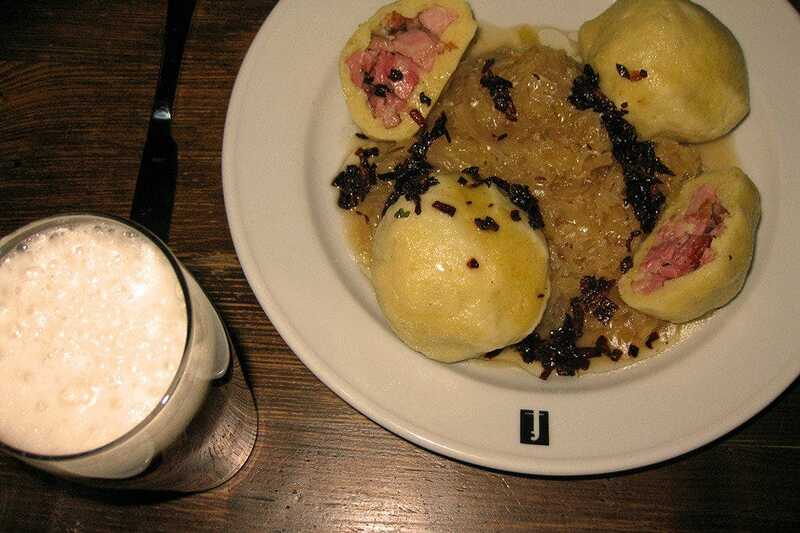 Some of the Czech specialties are worth the climb up. Start with Becherovka, a traditional herbal bitters made in Karlovy Vary. The venison goulash served with crusty homemade bread is feast for the eyes and palate. Duck breast with sage is an all-time favorite. Czech cuisine is heavy on meat but Nebozizek surprises vegetarians with a choice of three delightful dishes. The restaurant is popular with tourists and locals who come here for wedding receptions. Sit in the Baroque dining room or on the summer terrace with a corner view of Prague Castle. The candle lit dining room is the perfect setting for a romantic meal. Crystal chandeliers, bowls of shining fruit and colorful flowers in elegant vases set the tone. Classical elegance combines with tantalizing dishes prepared by Martin Blazek, Chef de cuisine. The two- or three-course lunch menu is different for each day of the week and might include creamy carrot soup followed by beef medallions in peppercorn sauce or vegetable risotto for vegetarians. Sunday brunch features English style breakfast but also tapas, Caesar salad and vegetable skewers. Be sure to taste the apple strudel, one of the best in Prague. 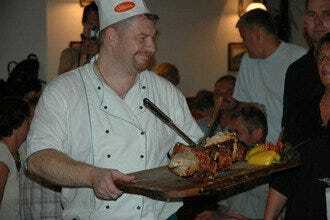 Palffy Palace is always full of happy eaters who know good value. Located on picturesque Kampa Island and very close to Charles Bridge, Restaurant Dvorak is the perfect spot for a romantic dinner. Make yourself comfortable on the summer terrace that spills out onto the pavement in the shadow of age-old trees. Enjoy a bit of people watching with a glass of wine or a full lunch or dinner. The food is tasty and home cooked Czech and international cuisine. Be sure to taste Prague ham with pickled cucumber or Old Czech cold platter with smoked ham, mozzarella cheese and big hunks of crusty bread. If you are an Italian mood, savor gnocchi with mushrooms and cream. Czech beer, Pilsner Urquel or Gambrinus, is the perfect accompaniment with your meal. 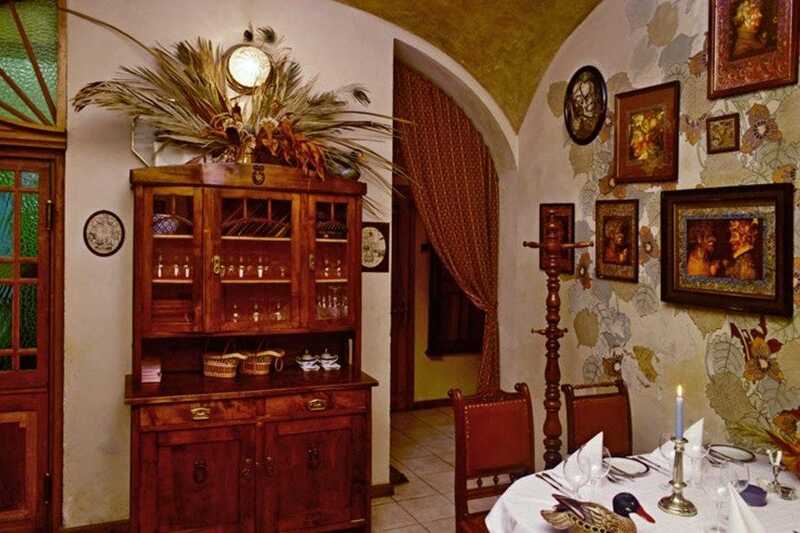 Located on the Kampa Island, in a building dating back to the 16th century and rebuilt early 19th century, U Zlatych Nuzek, Czech for In the Golden Scissor, is a stylish restaurant in the heart of Mala Strana. If you are looking for a quiet place far away from the tourist crowd, U Zlatych Nuzek is what you are looking for. On summer days you can enjoy Czech delicacies like Old Prague goulash in the outdoor garden restaurant with a beautiful view of Charles Bridge. In the evening you can go for a candle-lit dinner or just a glass of wine or beer. Bellevue means French dining with a breathtaking view, that's so spectacular it will give you goose bumps. The multicourse tasting menus includes crisp roasted duck in honey-lavender sauce or grilled suckling pork chops with mustard sauce – true adventures for the taste buds. The sommelier offers a special wine list that features classical French to local wines grown in the vineyards of Moravia. 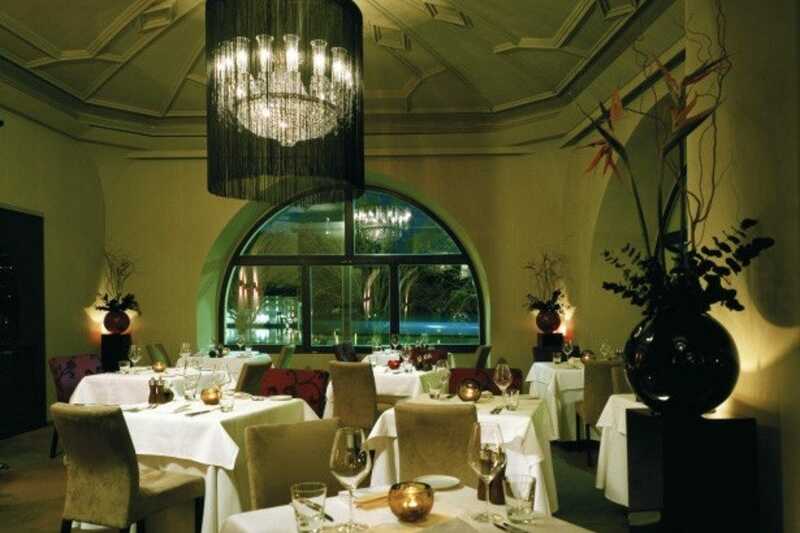 The interior of Bellevue is a delightful blend of modernity and tradition. The soft mauve and beige shades go well together with the crystal chandeliers, the classic furniture and the crisp white tablecloths. On warm sunny days, diners can enjoy their meal al fresco while taking in unrestricted views of Prague Castle across the Vltava River. 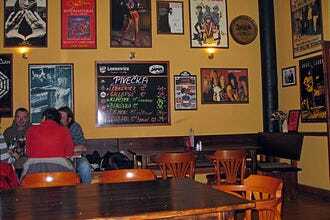 Located in a little back street in the Mala Strana quarter, U Modre Kachnicky is a gourmet paradise for meat eaters and in particular for lovers of duck. Classic furniture, damask upholstered chairs and graceful drapes make you feel as if you step back into the 1920s or 1930s. Oriental rugs are scattered on the tile floors, framed prints and mirrors make U Modre Kachnicky into one of the most intimate and stylish restaurants in Prague. Most of the main courses feature duck; roasted with walnut stuffing, glazed with honey or flamb� with slivovice, which is no surprise as U Modre Kachnicky is Czech for In the Blue Duck. U Tri Zlatych Hvezd, The Three Golden Stars, is situated in a three-hundred year old building under the arches of St Nicolas Church in the Mala Strana district. It's No 8, but you will find the restaurant quicker if you look out for a house sign showing three stars. Be sure to try roast duck with red cabbage and knedliky, Czech type dumplings and ideal to mop up the rich sauce. The menu is available in six languages, meaning that you won't be the only tourist. On the other hand it makes ordering a meal quite easy.